steveo12345 replied to Pat - Community Publisher's topic in Welcome! Click here to learn how to Post! I emailed Dr. Timothy Carman, La Jolla, California about a week or so ago about hair transplant questions and haven't heard anything back. This seems somewhat strange from someone so highly qualified. Is he still doing hair transplants? Just teaching now? Anyone heard anything about him lately? This patient is a 32 YO male who experienced loss of definition of the frontal hairline which is consistent with his fathers pattern. There is no family history nor clinical evidence in this patient of crown thinning. Two procedures of 1601 FU grafts and 1609 FU grafts were performed a year apart, to obtain the final hairline shape, location and density. Graft design pattern and robust long term growth were achieved from conservative donor strip harvest, leaving the cosmetic quality in the donor virtually unchanged. Patient is a 26 yo male with MPHL manifested as a loss of frontal hairline, frontal forelock, crown and midscalp density. The hairline was recreated in a conservative design, frontal forelock and midscalp density were addressed, and the crown underwent a conservative reconstruction. Total FU grafts used: 3092. Donor and graft quality preserved using "FUT" excision. Picking Dr for 3rd and final procedure. This patient is a 62 YO male who presented with loss of frontal hair line and frontal forelock density. His donor had lower than usual density, about 60 FU/cm2 (vs average of 90 FU/cm2). This resulted in a donor yield of approx 1900 FU grafts. Patient returns at about 15 months post op very happy with the improvement. Note the last photo which demonstrates the typical donor scar from a strip excision when conservative, plastic surgical techniques are employed as standard procedure. Patient is a 42 yo male who presents with an advanced degree of MPHL. Patient had thinning of the HL/FF/Midscalp and crown early in life with stabilization over last ten years without medications. Total 3757 FU total. Patient is a male in his late twenties who has been slowly thinning due to Androgenic Alopecia affecting his hairline, frontal forelock, midscalp and bilateral temporal points in a Norwood 5 pattern since his early twenties. He has mild crown involvement as well. Understanding he will continue to have further losses, he understands the need to manage his limited donor in such a fashion that initial transplantation occurs in a limited area which can be addressed in the future without fear that grafts are spread out over too large an area, which would result in a "grafty" appearance later on in life. 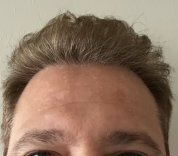 At one year post-op, the qualitative change in the appearance of his hair in terms of hair shaft caliber, distribution, shine and coverage are greatly improved over the pre-op baseline. The conservative hairline will work well into his 50's and 60's, and precious donor graft reserves have not been squandered on an unnecessarily dense frontal hairline, freeing those reserves for the midscalp and anterior crown as needed as he ages. The last photo illustrates the 1 mm donor scar which should be the normal expected result using conservative, state of the art surgical technique. 2200 Total FU grafts. This 42 yo male experienced extensive balding through his twenties and thirties, yet was blessed with a very good donor density. 3088 total FU grafts. San Diego / Dr. Carmen patients? Hey there, I've been researching HT for some time and I live in San Diego. I've consulted with Dr Carmen a couple times now and I'm thinking of going ahead with a procedure. My main hangup at this point is that I've never knowingly met anyone that has had a HT so I haven't been able to see it with my own eyes and get an honest opinion from someone in person. In order to trust this whole process, I want to see the results with my own eyes. I'd like to find someone in the San Diego area (or within driving distance) that has had a procedure with Dr. Timothy Carmen and meet them to discuss their opinion of the surgeon and look at their results first hand. I will gladly pay anyone one that's interested in meeting me for their time. Thank you very much. I also am thinking of using Dr. Carman and wondering if you went ahead with the procedure or talk to anyone that has used him? Patient is a 33 yo male with very mild recession of the hairline and crown area. His family history is similar on his fathers side, with no hair loss history on his mothers side. Patient has had this condition which has stabilized since about 26 years of age. Our goal was to recreate a very subtle change in his frontal hairline, as well as address the minor thinning in the crown which was a concern to him as well. A total of 1617 FU grafts were obtained via strip excision; 730 one's; 779 two's; and 108 three's. A photo of the donor incision is included to illustrate the type of donor scar which should be most anticipated in the great majority of patients, given the current state of the art techniques we as Hair Transplant Surgeons utilize when performing conservative surgical methods. Patient is a 37 YO asian male who presents with loss of frontal hair line, frontal forelock, and midscalp/anterior crown thinning. The cornerstone of long term success in hair transplant surgery is understanding the supply/demand inequity which is a factor in over 90% of candidates: there is a limited/finite supply of follicular units available in the patients lifetime, so the artwork design and subsequent placement must respect this overriding concept. This generally translates into higher, more receded/diffuse hairlines and less aggressive crown reconstructions in order to constrict the total area to be transplanted in a pattern that mimics those naturally occurring thinning patterns in nature. Her we see a diffuse, receded hairline created along with good density realized in the midscalp and anterior crown area. This allows for future loss to be successfully addressed as the patient experiences any further progression of his hair loss. Total: 2184; Ones: 849; Two's: 1082; Three's: 253. Patient is a 32 yo Male with loss of definition of the frontal hairline, frontal forelock and midscalp area. We are looking to recreate the hairline and the density in the Frontal and midscalp areas. Patient has elected not to take medications to slow loss. The last photo demonstrates a typical donor incision at one year post surgery. This patient is a 51 YO male with a history of thinning frontal hairline with bilateral recessions. He wanted to recreate the frontal hairline and receded areas to enhance his appearance in an age appropriate manner. We transplanted a total of 2017 FU grafts into a new frontal hairline design, along with increasing the central frontal forelock density to support that hairline. The last phot in the series shows the donor scar appearance at this one year post op date. This is a 42 YO who presented with loss of his frontal hairline and frontal forelock. He had been wearing his hair longer in order to cover the areas of hair loss, but this was becoming too much for him, maintenance-wise. This is a shot of his results at the early stage of four months. He was very pleased as for the first time in "forever" he was able to style his hair shorter. Total FU grafts: 592 ones; 2101 two's; no three's or fours. At this stage he probably has about 35% in growth. Great result and plan for this young man Dr. Carman! Looks good Dr. Carman One day this young patient will fully appreciate your conservative approach preserving all those future donor grafts. This patient is a 36 YO male who experienced slow loss of his frontal hairline, showing bilateral recession associated with thinning in the frontal forelock and central midscalp. His family history and physical exam were negative for significant crown loss. We were able to rebuild these areas over two procedures, advancing the hairline from procedure one through procedure two. Graft Counts: 1228 ones; 2744 twos; 583 threes. This 60 yo Gentleman presented with loss of definition/thinning of his frontal hairline. At 7 months post-op he presents very pleased with his results to date. At seven months post surgery, we tell patients that in general they can expect about 70% of the grafts to have grown in, ie, they can expect another 30% to grow in in the next five months. This case is no different. Graft count: One's = 1040; Two's = 967; Three's = 10. Do Any Of The Clinics Offer Scar Revision / trichophytic closure ? Patients is a 53 YO male with AA affecting his hairline, frontal forelock, midscalp and crown. In addition, patient has hair of very thin caliber, which translates as less total hair mass than similar graft counts with larger diameter hair shafts. 2424 total grafts; 683 ones, 1506 two's, 133 three's, and 102 DFU's. In addition, this case is challenging as the patient has a larger than normal surface area due to a larger than average head size. His good scalp laxity in the donor made up for his lower than average density of 75 FU/cm2. The result is at 14 months post op. This is a patient in his late twenties that presented with a request to re-establish a hairline he had lost due to androgenic alopecia. He had undergone a previous procedure of about 6-700 grafts which were placed in his frontal forelock area only. Those were beginning to show as his hair continued to recede. His familial history has only frontal loss patterns, with no crown patterns seen on either side of his parental tree. Total FU grafts: 1983; Ones: 951; Two's: 903; Three's: 129. This pleasant gentleman in his late twenties has been experiencing MPHL affecting his frontal hairline, midscalp and crown. He decided he would prefer to not take finasteride, and does not use any topicals as well. Grafts harvested through strip excision. The result shown was at 15 months post-op. Total FU grafts: 2423; 585 ones; 1710 two's; 128 three's. Tricophytic closure.